On July 8, 2017 at 1:13pm a fire was reported on the Needle Rock Rd near Ponderosa. The Fire Brigade met with the U.S. Forest Service at the scene of the fire, just past 1:30 pm. We were asked to transfer our 240 gallons of water in our Fire truck into one of their engines that currently was engaging the fire. 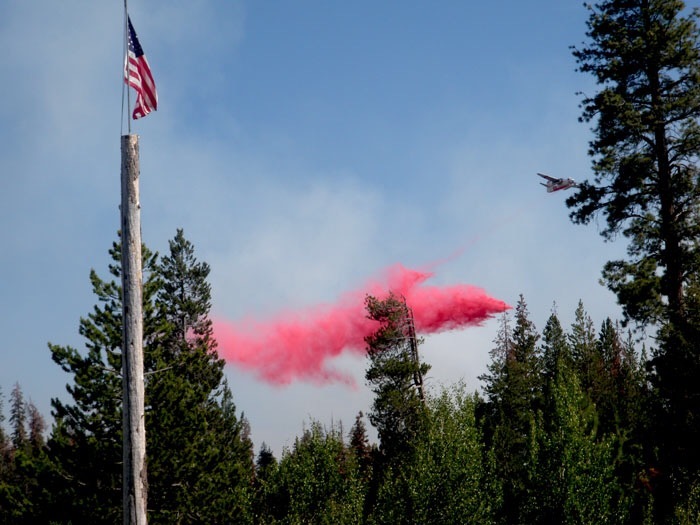 The fire soon crossed the road and began to move toward the Ponderosa. Once our truck water transfer was complete, we were asked to stand down and leave the scene of the fire. We hooked up a hose to the hydrant on Carter and parked the fire truck on Meadow Ct., as the fire began to approach the subdivision. 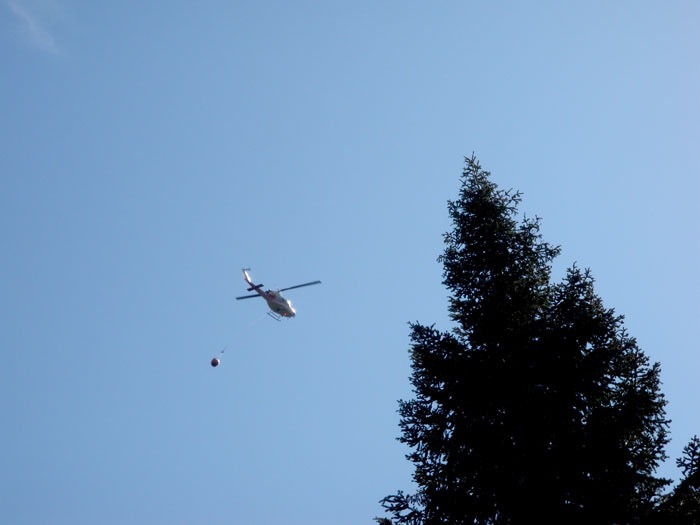 Two helos began dropping water directly on the fire, while the fixed wing aircraft also began to drop fire retardant in front of the fire. The winds began to shift and the fire moved around Kramer Meadow. We then shifted the fire truck over to the end of Marylyn in order to keep our eye on the fire and follow it’s progress. 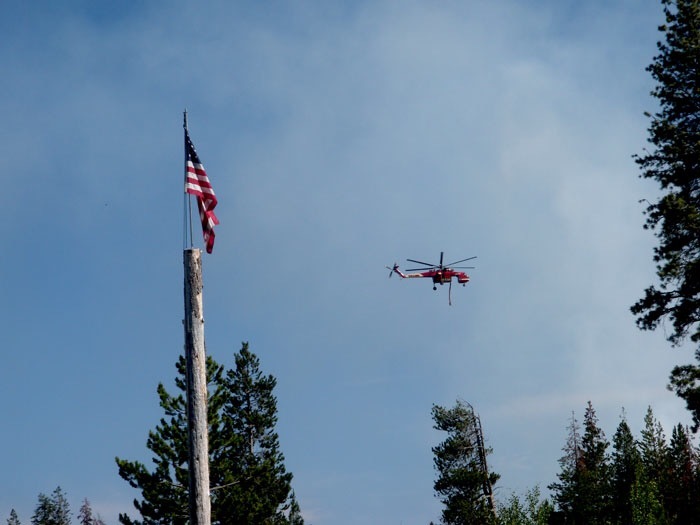 With the Forest Service ordering full suppression of the fire, to protect the Ponderosa community, the fire was reduced and finally came under control. With the air support and direct attack by firefighters the blaze was extinguished after burning approximately 21 acers. Fire teams continued to patrol and monitor the burn area for a week to ensure no flare-ups occurred. All though the fire’s point of origin was within a prescribed burn area, the cause of the fire is under investigation. 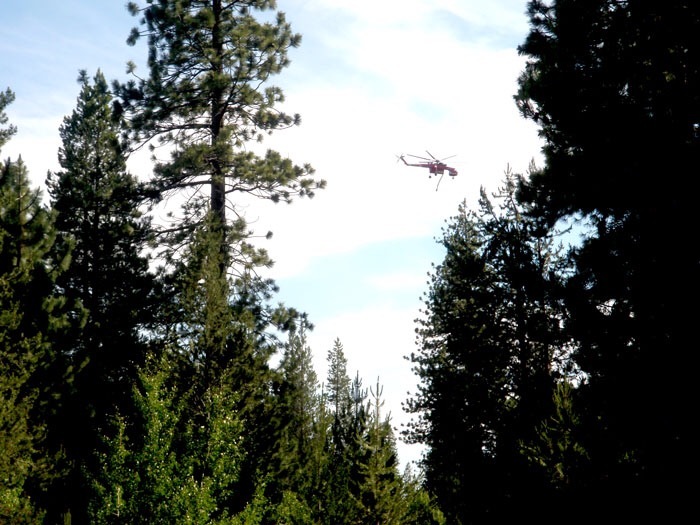 While the Ponderosa was poised for evacuation, it was not necessary, due to the commitment of assets and response by the County and Forest Service. They sent 8 engines, 6 hand crews, 2 helos and fix-winged aircraft. A shout out goes to our neighbors from Camp Nelson, Brian and Jan Swanson, who brought up a trailer to assist in evacuation, had it been necessary. It is a breath of fresh air to have good neighbors that are so thoughtful and considerate during an emergency. It’s one of the many factors that make the mountain a great place to live!